Schein is possibly the trickiest platformer you will play all year. 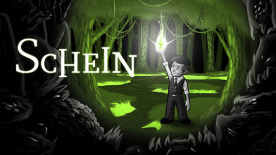 Schein is an award winning puzzle platformer that tells the story of a desperate man, who ventures forth into the mystical swamp in search of his missing son. As he gets lost in the darkness, a wisp appears that offers him help, guidance, and its magical power: A light that changes the world. Rise to the challenge! Use this mighty power and your wits to unveil new dimensions, defeat deadly beasts, solve tricky puzzles and uncover hidden paths through the murky swamp.